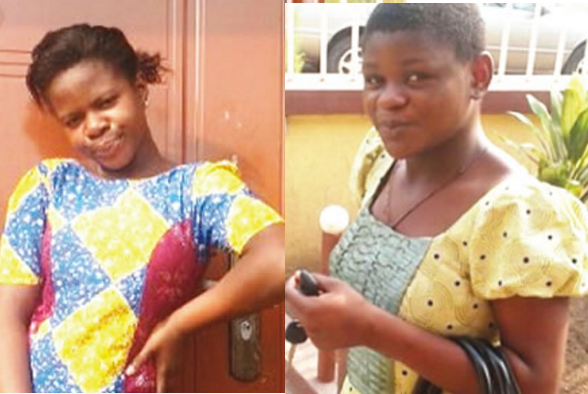 Faith Ayeh, who was allegedly kidnapped by her parents’ maid, Mary, in the Iju Ishaga area of Lagos State, has been found. Saturday PUNCH learnt the victim was found in Abeokuta, Ogun State by a man, who had read about their situation.The resident was said to have called Faith’s parents, who then raced to the area to bring her home. Mary was employed by the Ghanaian family about five months ago to assist with house chores at their home on Kudirat Abiola Estate, Akute Road, Iju Ishaga. She was also reported to be assisting the mother of the house, Glory, with her frozen foods business on the street.However, the suspect allegedly went out with the victim last Thursday, claiming Glory sent them on errands when she was challenged by the family driver. Their whereabouts had remained unknown since then. Faith’s father, Paul, told Saturday PUNCH that his daughter was found by a man who read the report. “The man called us that he found my daughter on the road. He said he saw her picture in your newspaper and he got my number to call us so we could come and take her. Asked if the maid had been arrested and what the daughter said, he said his daughter and wife were on their way home, adding that he would call back as soon as they reached the house. The state Police Public Relations Officer, SP Dolapo Badmos, said it was a case of absconding, adding that Faith fled her parents’ home on her own volition. “What happened was that the girl, Faith, claimed that her mother was too harsh on her and she decided to run away with the housemaid, who was eloping with her boyfriend. When they got to Abeokuta, the home of the boyfriend, the man decided to habour the two of them. It was there that he was sleeping with the maid, Mary, who had equally been declared missing by her parents.